This title, directed by Ozu Yasujiro, was screened in this year’s Berlinale Classics. The film is in Ozu’s standard academy ratio and black and white. This was the premiere of a restored version screened from a 4K DCP. 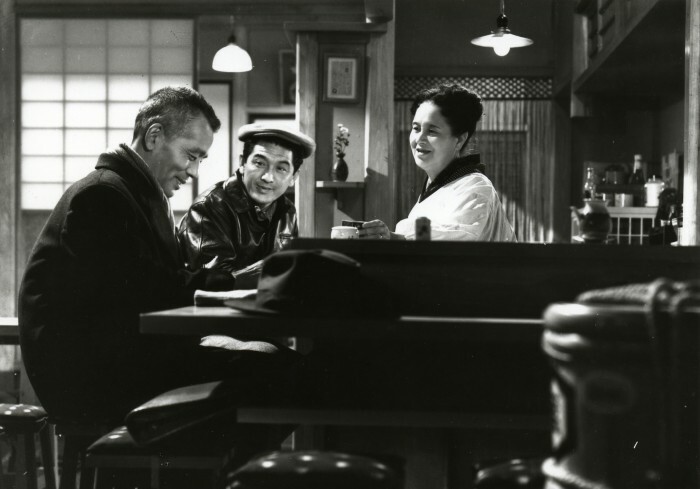 It is in a number of ways typical of late Ozu; the regular low angle camera; the deep focus and staging; the focus on props within the frame; the insertion of what are called ‘pillow shots’, brief sequences that are not obviously part of the developing plot; and the ‘lounge music’ which sounds non-Japanese in this most Japanese of directors. But the plot was unusual for Ozu, involving marital discord, an extra-marital affair (safely in the past) and a troubled young woman who is pregnant and has to consider abortion. Yet this plot is made partly typical with Ryu Chishu as a single-parent father Sugiyama Shukichi and a manager in a bank with Hara Setsuko as Numata Takako, the dutiful daughter, though again, unusually, she is married and has a baby daughter. Takako has returned home to seek refuge from her husband Numata Yasuo (Shin Kinzo) who drinks and is frequently violent. Akiko (Arima Imeko) is the youngest daughter. She is described as ‘wild’ by other characters. During the film she spends much time seeking out her current boyfriend, Kenji (Taura Masami); and a regular haunt is a mah-jongg parlour, where people play and gamble. It is Akiko’s plight and the reappearance of her long-lost mother, Soma Kikuko (Yamada Isuzu), that provides the dramatic focus of the narrative. Wim Wenders gave an introduction to the film; his comments were given in German but I noticed that he used the term ‘noir’ at one point. And shadows and low-key lighting feature in many scenes. One theme in the film is late 1950s Japanese youth, seen here as breaking with the mores of the older generation. This is a thematic that is found in the films of Oshima Nagisa but it is unusual for Ozu. The use of low-class and unseemly settings would be more typical of Naruse Mikio, but this version is replete with the resignation that typifies Ozu. It seems that Ozu and his long-time collaborator Noda Kogo were responding to the new youth films then appearing in Japan. But the story is atypical of their work and is fairly melodramatic. Apparently it was the least successful of Ozu’s title in this period. 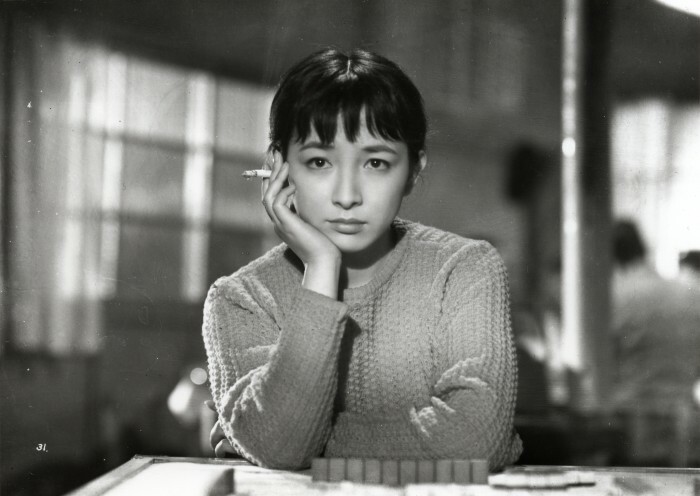 The central plight of Akiko is some way from the situations that suit Ozu’s reflective style. In terms of values the film is dominated by Shukichi. The final scene focuses on him and Takako. At this point she has decided to return to her husband with their daughter, prompted by the fate of Akiko and stressing that a child needs ‘both parents’. Kikuko meanwhile has left Tokyo and we see her on the departing train vainly hoping that Takako will come to see her off. Together these scenes put the blame on the mother as indeed does Takako at one point. But since we only hear brief details of the marital breakdown and not from her point of view I found this problematic. Shukichi’s treatment of Akiko is cold and distant and it would seem likely that this is also a factor. Akiko appears to be trapped in a home that espouses traditional values, in opposition to the young values that she holds. I think Naruse would have offered a more sympathetic treatment of the mother and a stronger grasp of the lower class milieu. Ozu works here with regular collaborators including the joint script-writer Noda Kogo. Atsuta Yoharu provides the cinematography which is finely done. The film is as absorbing as Ozu’s other late films. However, I did think that the structure was not quite as finely tuned. There is a scene in the mah-jongg parlour where the players discuss Akiko. The scene is clearly designed to inform the audience of aspects of her situation that are hinted at rather than made explicit. However, by this stage these seemed to me fairly obvious and I found the scene redundant: an unusual feeling in a film by Ozu. This entry was posted on March 20, 2018 at 10:51 am	and is filed under Japanese film. Tagged: Berlinale. You can follow any responses to this entry through the RSS 2.0 feed. You can leave a response, or trackback from your own site.